Steiff Aunty Lucy Teddy Bear is made from the finest dense mohair in a light brown tipped colour. 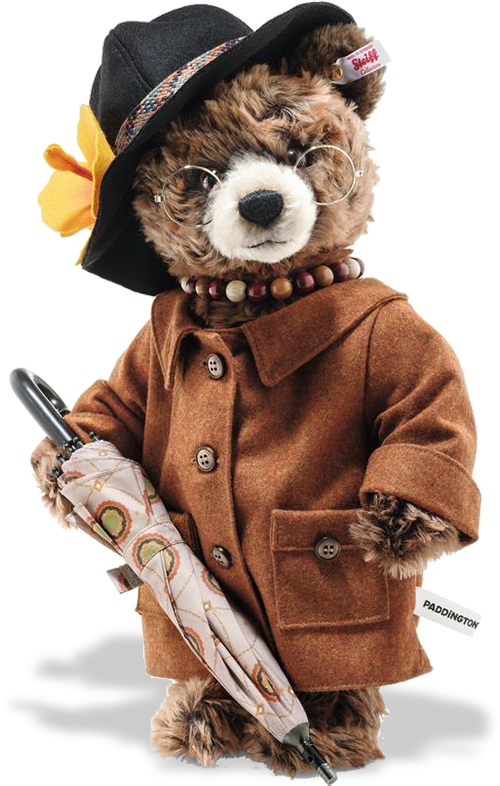 As always Steiff have dressed her so smartly - just look at her and imagine her in a very special place. "Aunt Lucy said that if we’re kind and polite, the world will be right." 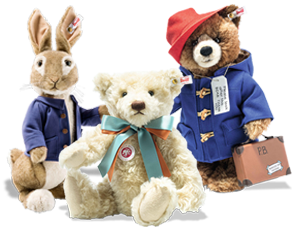 Steiff Limited Editions Real collectors items for you steiff bear collectors. These steiff bears and animals come with a white label with either red or black writing. They have the famous Steiff tag and a gold plated button in the ear - a sign of quality and authenticity. 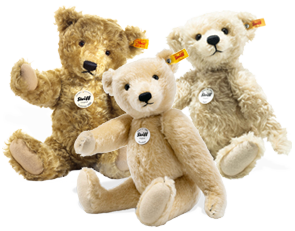 Steiff Classic Bears This range offers a selection of genuine traditional Steiff teddy bears. Each bear has the famous Steiff tag and button in the ear - a symbol of quality. Every family should have a classic Steiff Teddy Bear. Steiff Cosy Bears Soft and cuddly. The ideal way to say 'I love you' to the special child in your life is with a Steiff Teddy Bear. Comes with the famous Steiff tag and button in the ear. Children deserve a Steiff Bear. 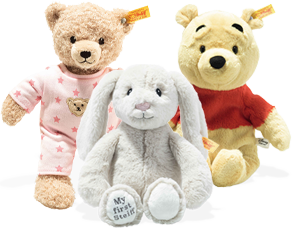 Steiff Personalised Range These Steiff bears make wonderful heirlooms and gifts. You can personalise a name and/or date on one of the paws. A real gift of love and delightful way to mark that special occasion. 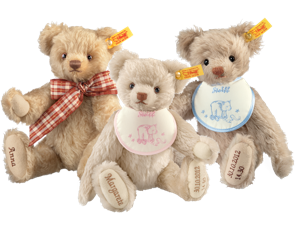 Each Steiff Teddy Bear has the famous Steiff tag and button in the ear - the sign of a genuine Steiff. Steiff Animals The Steiff dream began with Margarete Steiff making an elephant pin cushion. 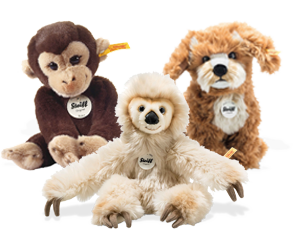 Now this dream has been extended to a delightful range of Steiff animals, pets and other loveable characters. All with the famous Steiff tag and button in the ear - a sign of quality. Steiff Baby Range The Steiff Bear Baby Range is for newborn and upwards. Ideal way to welcome a special baby in your life. All with the famous Steiff tag and button in the ear. Very quick and reliable service as usual. We have bought all our Steiff's from here. The free gift box is a very nice touch especially when giving as presents. Was delivered very nicely boxed, together with a gift tag worded as requested. Service was excellent & speedy. The history of the Teddy Bear - Who Invented Him? The history of the teddy bear is not really a straight forward one. It has been a widely debated for many years, who actually invented the teddy bear. So perhaps starting out by trying to establish this, will shed some light and give you an insight as to the beginnings of this well-loved toy! The name teddy bear comes from former United States President Theodore Roosevelt, who was commonly known as "Teddy". The name originated from an incident on a bear hunting trip in Mississippi in November 1902. After having no luck, himself catching a bear, one of his aids caught and tied a black bear to a tree, so that the president could shoot and have his kill. He refused to shoot the bear himself, deeming this unsportsmanlike, but instructed that the bear be killed to put it out of its misery, and it became the topic of a political cartoon by Clifford Berryman in The Washington Post on November 16, 1902. Morris Michtom a Russian-born businessman and inventor saw the drawing of Roosevelt and came up with a "Teddy" bear to go along with the story and the cartoon. This became an immediate success and Michtom founded the Ideal Novelty and Toy Co and started to produce the teddy bear on a larger scale. At roughly the same time in Germany, the Steiff firm, unaware of Michtom's teddy bear, produced a stuffed bear from Richard Steiff's designs. While attending the School of Arts and Crafts in Stuttgart, Richard Steiff would regularly visit the nearby Nill'scher Zoo. He spent most of his time sketching inhabitants of the bear enclosure and in the summer of 1902, after one of his visits to the Zoo, a prototype teddy bear called, Steiff Bär 55 PB was produced. The Steiff bear was born. Richard Steiff born on February 7th, 1877 in Giengen, was a German designer. Steiff attended the School of Arts and Crafts in Stuttgart, where he developed and perfected his skills as a toy maker. In 1897 having successfully completing his schooling, Steiff joined his Aunt Margarete's toymaking company and initially started work on a number of other projects before being inspired by a trip to Nill'scher Zoo in the summer of 1902. This particular trip he spent much of his time drawing the residents of the bear enclosure. His sketches of the bear were incorporated into the prototype of the toy Steiff bear he created in 1902 and codenamed Steiff Bär 55 PB. He took the Steiff bear prototype and it had its debut at the Leipzig Toy Fair in 1903. The Steiff bear initially attracted little attention, but its fortunes were saved when an American buyer snapped up the entire lot of 100 Steiff bears and ordered another 3,000 just before the exhibition finished. Steiff was unaware that at the same time he had produced his Steiff bear, an American toy maker and inventor, Morris Michtom had come up with his own invention, the teddy bear (named after the American President Theodore Roosevelt). He was having huge success in the US with his teddy bear. The American buyer, recognising the potential the Steiff bear could have back in the States much like Michom’s teddy bear, so took Steiff’s invention and ran with it. Success in the United States quickly followed and in 1904 at the St. Louis World's Fair, Steiffs sold 12,000 Steiff bears and received the Gold Medal, which was the highest honour at the event. Steiff quick adopted the trademark "Steiff - Button in Ear" to fend off the vast numbers of cheap imitations and to make the company's own high-quality products unmistakable. From 1906 onwards, the Steiff bear was known and sold as a teddy bear. Later the same year an international company was founded and still trades under the same name today, Margarete Steiff GmbH. 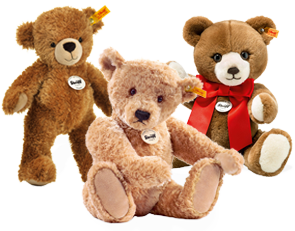 Today Steiff is probably the world’s premier manufacturer of high-end toys and collectibles. Steiff is internationally renowned for its exceptional quality, Steiff still utilizes traditional materials and proven manufacturing techniques to create its unique and highly prized products. We get to enjoy and collect the Steiff bear today, knowing the amazing history and origin behind this little ‘Teddy’ bear!